Conducting research to aid the conservation of a species whose numbers have declined is often challenging precisely because they are scarce. For animals that are naturally secretive, they are even more difficult to detect and therefore study. One such species is the alligator snapping turtle which after decades of population decline has been petitioned for federal listing as an endangered species three times. 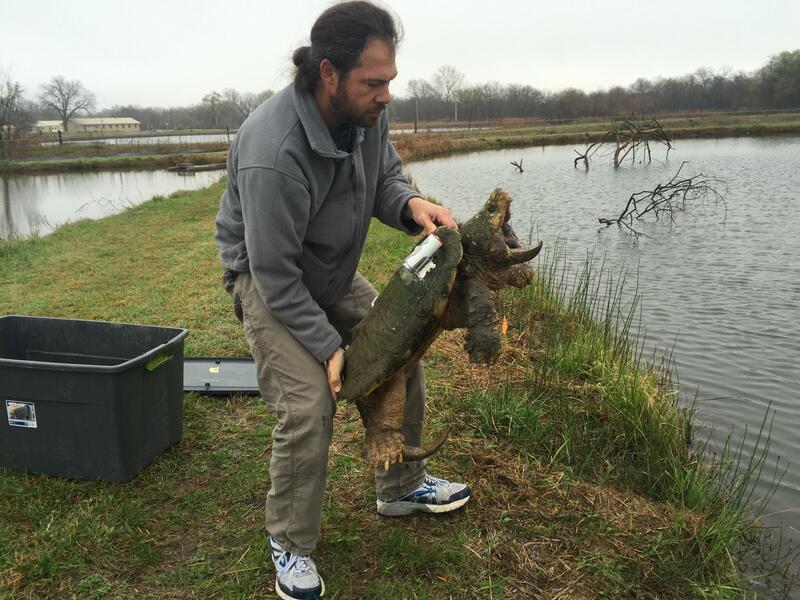 These large turtles are of particular interest to Dr. Day Ligon, associate professor of biology at Missouri State. I'm Nicki Donnelson, and Ligon is my guest today on the Missouri State Journal. "The alligator snapping turtle is a pretty impressive species of turtle. It's very aquatic, it's also very large. It's the largest turtle in the United States," said Ligon. "Males can get up to 200 pounds. They're very secretive. You're unlikely to see one, but they're also very prehistoric looking. They have very horny looking backs and very recurved beaks. They're very raptor-like. "As far as their conservation status, they're presently unlisted by the US Federal Government, but they are listed as a species of concern by the IUC and Red List which is an international list of threatened and endangered species. It is presently being considered for listing by the US Fish and Wildlife Service under the Endangered Species Act, but it's unlikely that there will be decisions made regarding that petition before about 2020." Alligator snapping turtles which are endemic to the Southeastern United States can solely be found in the rivers that flow into the Gulf of Mexico. In more recent years their habitats have been diminishing. Ligon elaborates. "One of the probably most important reasons is that rivers have changed a lot throughout a lot of their range. One of the biggest changes that has happened is the construction of dams that have prevented them from moving throughout their natural environment has really changed some of the habitat from riverine systems to more reservoir-like systems," said Ligon. "In addition to that segmentation of their habitat, they've been targeted to a large degree for turtle meat. That's not a thing that I've consumed and that maybe a lot of people have consumed. The fact of the matter is that a lot of people in the United States and elsewhere enjoy eating turtles, and because of their large size alligator snapping turtles have been targeted to a greater degree than a lot of other freshwater turtles." As a doctoral student in Oklahoma, Ligon became interested when a survey revealed that the species had been all but extirpated from their naturally occurring region statewide. In 2002 Ligon joined forces with a fish hatchery run by the US Fish and Wildlife Service which at the time had 16 adult alligator snapping turtles in its captive breeding program. Now they produce 500 to 600 hatchlings each year, keep them in captivity until they have grown and are less prone to predation, then release them into areas where the species has disappeared. "Since about 2008, so I guess for about the last decade, we have been reintroducing individuals in rivers where they no longer occurred. A lot of my research, and a lot of my students' research here at MSU has been focused on examining the effectiveness of that conservation strategy," he said. "We've spent a lot of time tracking and trapping individuals that we've released to determine how well they're surviving and thriving in the environments we've placed them in. "We're now at a stage where some of those animals that we released back in 2008 maybe are starting to reach sexual maturity. Alligator snapping turtles, like a lot of other turtles, are very long-lived, and because of that they also are very slow to reach sexual maturity until they're 15 or 17 years old. Up until very recently we really haven't had reproduction issues in the wild to deal with. We're now at a point where some of the animals that we produced in 2002 and 2003 are likely reaching sexual maturity. We're now at a point where we're starting to track those animals' reproductive cycles to determine if and when they start reproducing in the wild," he continued. "Ideally, what we would like is to establish populations that are self-sufficient, that can proceed into the future without human intervention. For that to happen there needs to be reproduction, so we're now at a stage we're starting to look for evidence of reproduction in these animals that we put out into rivers." One of the most exciting parts for Ligon is the technology that has enhanced research endeavors. "The kinds of technology that we've employed have included automated means for detecting animal activity and automated means for finding animals once they're released, so that we can do things like collect blood samples to monitor reproductive cycles and things like x-ray and ultrasound to visualize what's going on reproductively inside of these animals. Those technologies have been tremendously beneficial in giving us additional insight into how these animals are progressing towards becoming a viable and self-sustaining population," he said. That was Dr. Day Ligon, associate professor of biology at Missouri State University. I'm Nicki Donnelson for the Missouri State Journal. What can amphibians tell us about human health? Under rocks and logs, in burrows and underwater, Dr. Alicia Mathis finds fascinating creatures to study. Mathis, head of the biology department at Missouri State University, focuses her research on the behaviors of tiny amphibians and fish. One of the most common things these animals need to communicate about is predation risk. It’s been understood for awhile that alarm cues are received and understood by animals of the same species and of different species – imagine a minnow and a stickleback – but her lab has uncovered some surprising results. When a new viral outbreak like Zika occurs, panic ensues. People fear the unknown: transmission method, symptoms, prognosis and how widespread it might already be. This fear can paralyze an economy that usually thrives on tourism, according to Melanie Grand, assistant professor in the hospitality leadership department at Missouri State University.